As I was getting ready to go for a run the other day I was putting on my clothes and getting all of my gadgets together and realized, man I have a lot of stuff to put on and bring along with me. Then I had a minor freak out and thought I may be a little too high maintenance as a runner but then decided it didn't matter. Who cares how many gadgets I find that I need to run with, as long as I get out there, that's what really matters! So as I was running I thought it would be a good idea to share with all of you just what I bring along with me that makes running so much more enjoyable and comfortable at the same time! 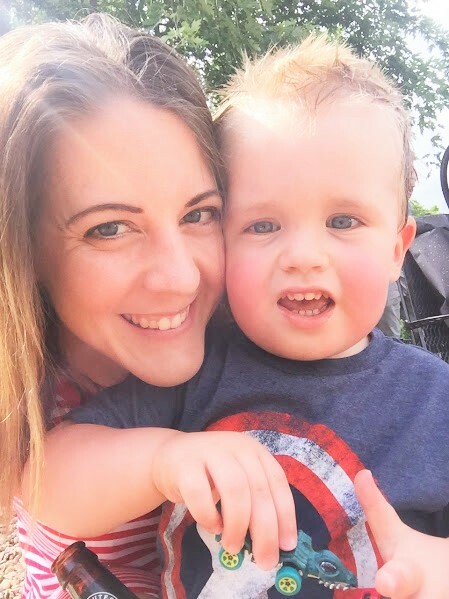 So this Fitness Friday blog post is dedicated to just that! 1. Athletic Sunglasses - I got mine back in 2011 so the ones I have linked aren't identical but you get the idea. These are by far the best sunglasses I have ever used to run in. Foster Grant has such high quality sunglasses for athletic purposes that, like I said before, I have had since 2011 and they aren't even close to being worn out! I've been looking at buying some more here soon just because I love the ones I have so much I want options! Anyway, I can't run without sunglasses. Even if it's cloudy or drizzling rain, my sunglasses never leave my face. For obvious reasons when it's sunny out they are a necessity but even in the cloudy/rainy weather they help keep my eyes clear and clean. 2. Headband - I prefer mine monogrammed! I personally made my own, however I don't sell them so I have linked a reputable Etsy shop where you can get your own monogrammed headband as well! Now when it comes to running, especially here lately, the heat has been so intense. I find myself sweating like crazy, so the head band comes in handy in catching the moisture and keeping it from running into my eyes! 3. Wireless Headphones - I can't explain enough how much I love these head phones! I use them all the time, not just while running, as does my husband! They are absolutely perfect for running. You can link them up to your phone through bluetooth and then while running, you aren't dealing with wires from standard head phones flopping all over the place. You also don't have to worry about the type of phone carrying case that you want to use while running, the wireless head phones make it extremely convenient! 4. SPI Belt - Now, everyone has their own opinions on what they like to use to carry their phones, keys etc. in while running. I personally didn't want anything that strapped to my arm, the sun tan lines just didn't seem appealing. I also have the iPhone 6 Plus so it's huge and almost all the other carriers that I have had in the past, the phone wouldn't fit. So I asked my Mom, who is more of a runner than I am, what she uses. She had this belt that she uses when she runs half/full marathons so I tried it out. My phone fit and I have been using it ever since. I'll have to invest in my own here soon, we are doing a half together in October so she'll need it back then! While running this sits perfectly on my waist and isn't in any way annoying, in fact I forget that it's even there! I would highly suggest this belt for anyone who is looking for something to carry their things while running! 5. Polar Fitness Tracking Watch - So I have done an entire blog post dedicated to this wonderful accessory, you can read it HERE. Anyway, I love being able to keep track of my heart rate as well as the calories I have burnt while running. There is nothing better than this watch to do just that, I can't say enough good things about this watch and would recommend it to anyone looking for a fitness watch. It keeps great track of my calories as well as my progress from run to run! So there you have it! 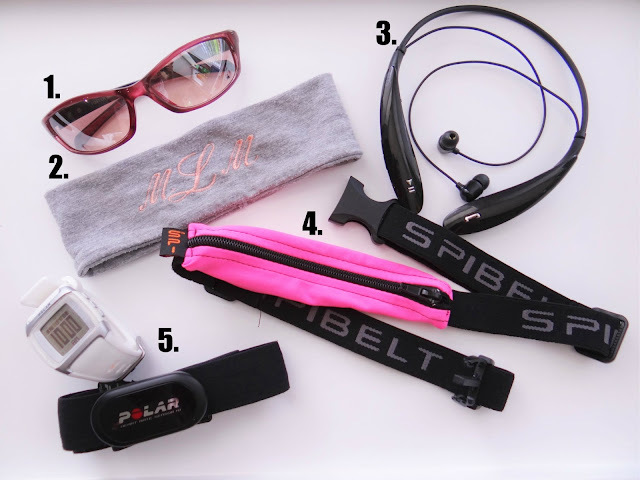 My 5 favorite gadgets to use while I run. I hope you enjoyed and gain some inspiration to help you feel comfortable and enjoy running as much as I do! If anyone knows me they know that I have a huge weakness for buying as many pairs of sunglasses as I can get my hands on. I'm not into paying high end prices for my glasses, however. I cringe at spending more than $10 honestly. With two little ones running around I just can't bring myself to pay any more than that on the off chance that they get their tiny little hands on them. I've been lucky so far and haven't had any accidents, even with my $10 sunglasses! I was fortunate enough to receive a free month of Ditto's Endless Eyewear program a little while back and today I wanted to share with you my thoughts on the process and product. Bottom line, they are a great company with incredible customer service and response time. I never felt like I was being pushed off or just given an answer to get me to go away. They were caring and wanted to make sure my experience was a great as it could be! Being that I don't ever spend any real amount of money on my sunglasses I was a bit intimidated to choose a pair that was worth a lot of money, however I figured go big or go home, right?! I chose a Prada pair which you can see HERE. With a retail value of $385 I was giddy and nervous when they arrived. Needless to say I immediately fell in love with these sunglasses. I did, however, make sure to wear them carefully when the kiddos wouldn't be going crazy all around, just to be safe! 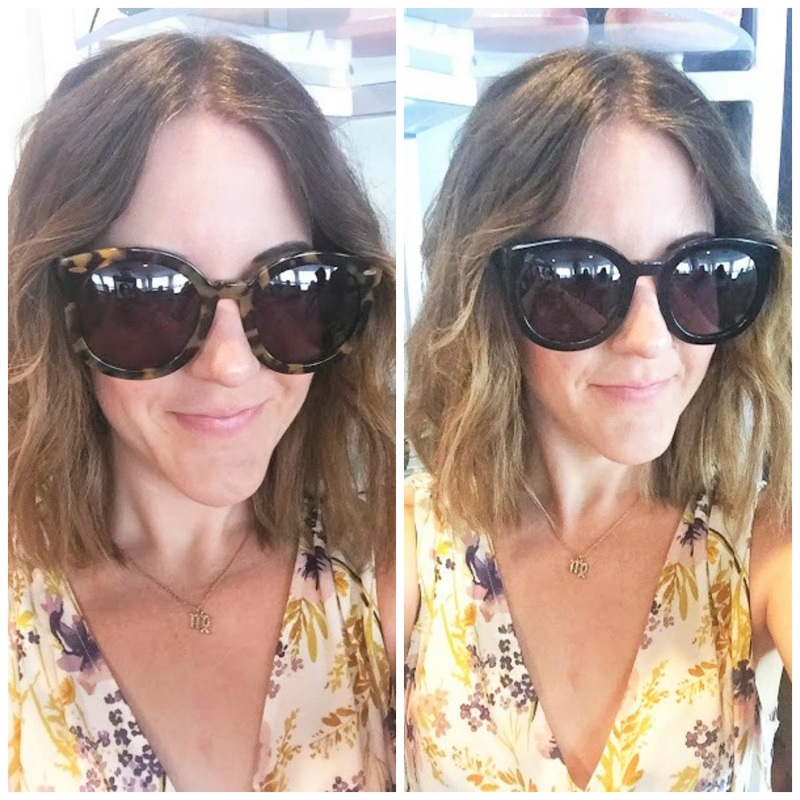 I got to try out a few more pairs at the Go Blog Social conference and let's just say, I want them all, all the time! After I placed my order the sunglasses arrived within a few days, even faster than I could have ever expected. Then when I was ready to send them back I was able to use a prepaid packing label that came with the glasses. All around such a simple process. For $25 a month you can change out sunglasses whenever you want. Making it simple and convenient to wear designer brands for a fraction of the cost! I look forward to taking part in this program here in the future for sure, once the kids are a bit older and I won't be as afraid of little hands getting a hold of these gorgeous sunglasses! So go on and check out the website! You won't regret it! 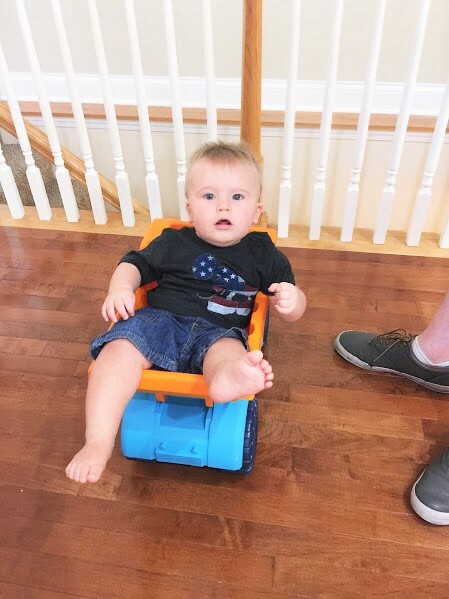 I hope everyone had a really great 4th of July weekend, I know we sure did! 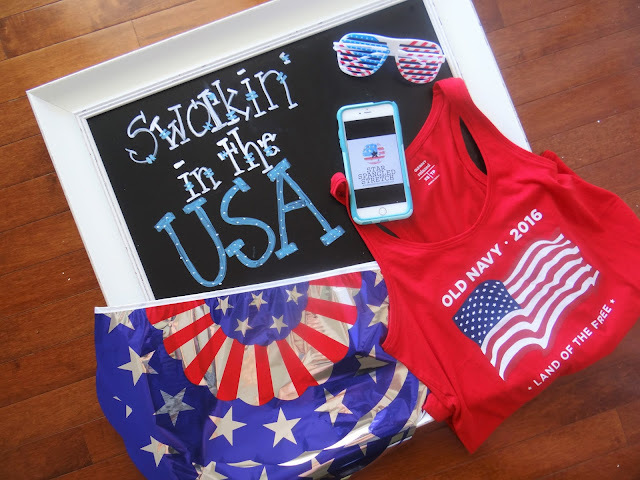 I also hope that you all had a chance to check out my post on Saturday, what to wear for the 4th of July and also my post yesterday with Sworkit, a little Star Spangled Stretch! We are fortunate enough to have some really great and close friends that we love spending as much time together as we can. 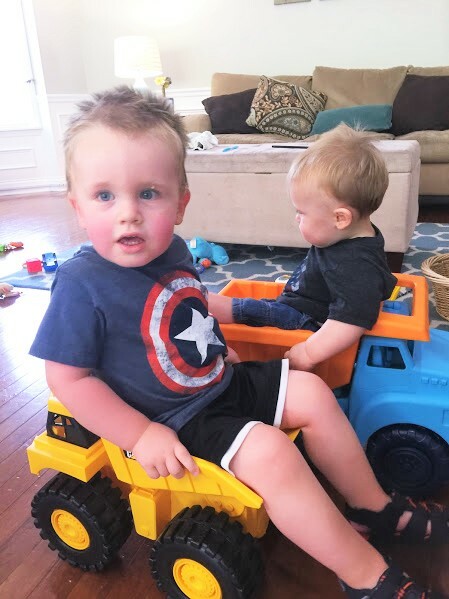 As we have been getting older, having babies and all that fun stuff, our times together have become a little more few and far between. 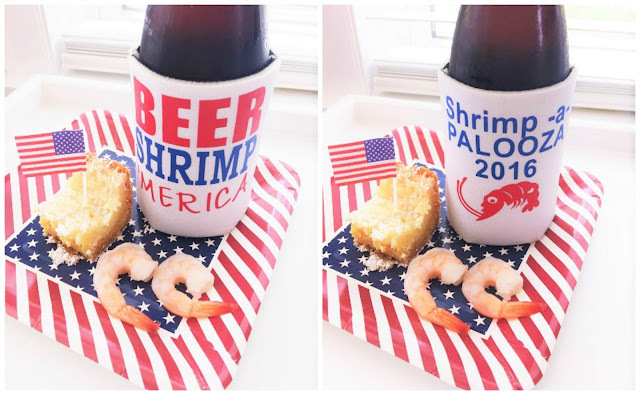 Every 4th of July we have made it a point to get together and have our annual Shrimp BBQ feast, in which we have titled it Shrimp-a-Palooza. It may sound silly and a little crazy but it is definitely one thing I look forward to every year. The past few years we have been able to host it at our home and I have to say, it has become something that I can't wait for every year! 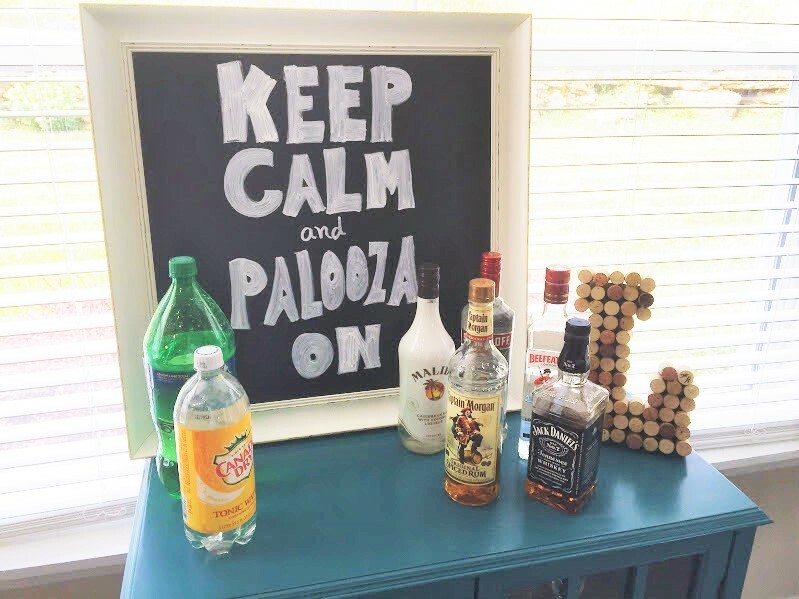 I love hosting get togethers of all kinds, but for me, this one is near and dear to my heart. I am already thinking about next year!!! We kicked off our weekend going to the St. Louis Cardinals baseball game. The weather was icky, rainy and cold but we sucked it up and made it through! We did attempt a group shot but it didn't work out so great, we're working on group selfies! Then came Monday and the real festivities began. 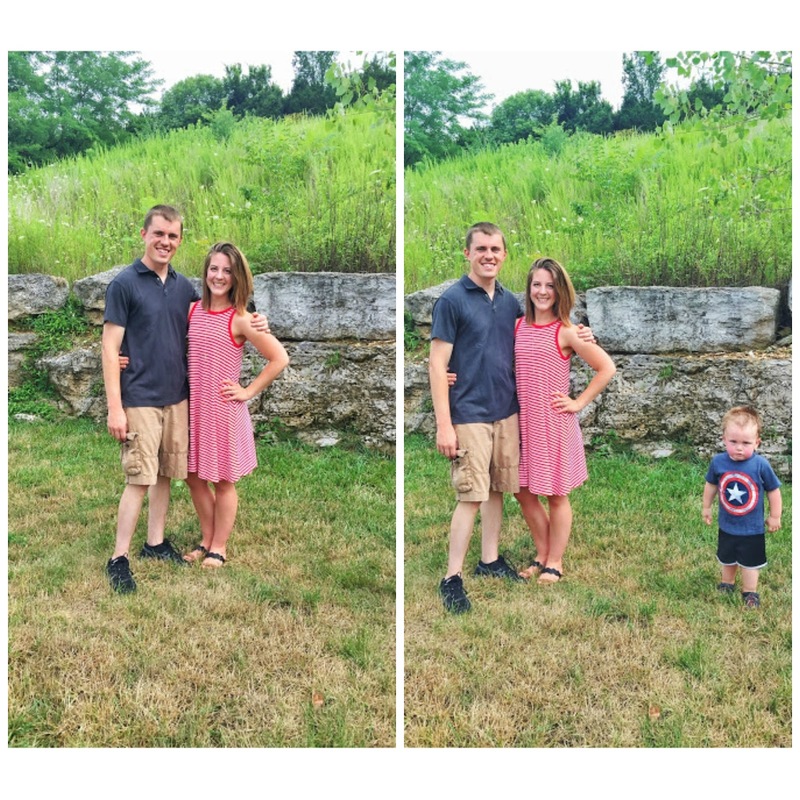 Oliver for the win in best photo bomb! We, along with the rest of our neighborhood, ended our night with fireworks!! All in all this weekend was a huge success and I couldn't be happier or feel luckier! Until next year Shrimp-a-Palooza, until next year! What did you all do over your long holiday weekend?! I hope you are all having a wonderful long holiday weekend! Around here it's raining and cold, not ideal for such a big weekend. However, we are powering through and getting ready to have our 9th annual get together with some friends today... We call this holiday Shrimp-a-PaLooza. Basically we just all get together, cook tons of shrimp and shoot off fireworks and celebrate America! So to honor this day, Sworkit and I have come up with a great stretch workout for you all to do today. This workout is all about taking it slow, stretching your muscles and keeping your body in tip top shape for the Summer! Be sure to DOWNLOAD THE APP and add THIS WORKOUT to your feed! Let me know your thoughts and if you are taking part in the Summer Workout Series!